At this point in history, as North Korea announces its nuclear capability, is there a need for a revised Treaty on the Non-Proliferation of Nuclear Weapons? How will a new treaty on nuclear proliferation manage intervention, from military to verification? What should the rules be for those who sign on to the new treaty as well as for those that do not? What are the actual thresholds that would call for intervention, and what are the possible consequences and repercussions of that intervention? What economic/development incentives could be offered to countries that voluntarily reduce or relinquish their nuclear industries? How could the nuclear industry be re-purposed – from technology to scientists – to environmental or economic projects? 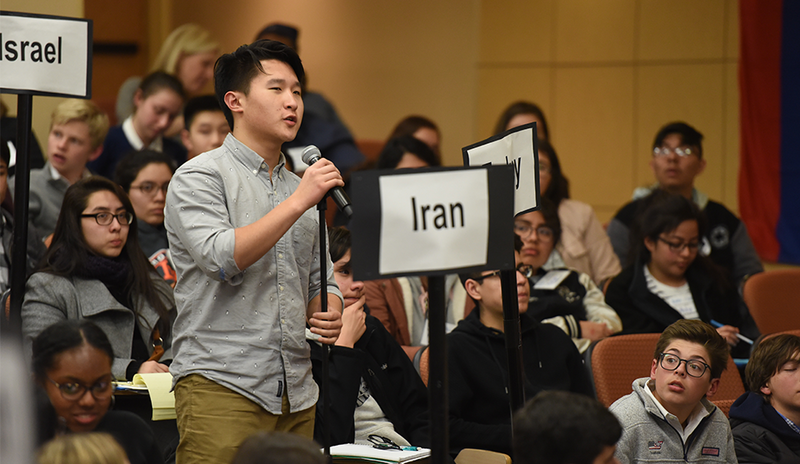 These were some of the questions that more than 250 high school students from five states addressed in this year’s Inquiry program, the Institute for Global Leadership’s global issues and simulation program for secondary schools. Now in its 27th year, its goal is to introduce students to the complexity of global challenges and then ask them to think creatively and collaboratively about potential solutions. The theme and simulation were designed and enacted by the EPIIC students on the Inquiry Committee, with all EPIIC students participating in the mentoring of the students and in facilitating the dialogues. The EPIIC Inquiry Committee worked throughout the first semester to determine the best way to tackle the issues in the simulation and to introduce the topic to the high school students, reading a broad range of articles and book excerpts. The main themes they decided on became the organizing committees: Sovereignty, Security, Diplomacy, Terrorism, Economics, Climate and Energy, and Disaster Preparedness. The roles that the high school delegations represented were: China, France, Germany, India, Iran, Israel, Japan, South Korea, Pakistan, Russia, Saudi Arabia, Turkey, United Kingdom, and United States. Schools came from the greater Boston area, Atlanta, Chicago, Indianapolis and New York City. Armed with the support of their Tufts mentors and prior research on the topic of nuclear weapons and nuclear energy among countries, the students arrived at Tufts for three days of discussion and debate about the NPT. Given the size of the group and Inquiry’s emphasis on participation, two simultaneous simulations were held: the Seoul Meetings and the Beijing Meetings. As the students were convening, ten countries currently had more than 15,000 nuclear weapons. The Bulletin of Atomic Scientists had recently moved the Doomsday Clock to two minutes to midnight, its highest level since the height of the Cold War in 1953. Along with the Korean peninsula, the Middle East and South Asia were potential trigger points. All of this brought home the urgency of understanding the current regime and thinking about ways to improve it. a plan in the case of a nuclear attack or accident, including addressing migration, relocation, transportation, temporary citizenship, etc. Would the Diplomacy Committee in the Seoul Meetings create the GYRBl Threat Classification System, classifying states based on their compliance with nonproliferation regimes, in an effort to increase transparency and disseminate information? Would the Security Committee in the Beijing Meetings sign PEACE (Protecting Everyone Against Criminal Enterprises), to stop the proliferation of nuclear weapons to non-state actors and to strengthen border security? In the Beijing Meetings, new treaties and plans to denuclearize were passed in different groups, including the proposed creation of the International Organization for Nuclear Humanitarian Crisis (IONHC) by the Disaster Preparedness committee which would sponsor meetings about preventive measures to nuclear attacks and ensure recovery through aid organizations in the case of a nuclear attack. The committees on Diplomacy and Sovereignty worked together to pass the South Asian De-escalation Treaty (SAND) that put caps on nuclear stockpiles India and Pakistan and ensured that countries would continue to have involvement in the decisions made surrounding the issues in South Asia. In the Seoul Meetings, the Committee on Climate and Energy proposed changes to the existing Nonproliferation Treaty, the Committee on Terrorism ratified the Security Association Fighting Extreme Terrorism Treaty (SAFETy) to ensure continued meetings and actions regarding terrorist groups and security breaches around the world, and the committee on Diplomacy discussed the Treaty of Vladivostok without reaching a unanimous conclusion. Concluding remarks from each delegation and committee relayed a diverse array of messages about the subject of denuclearization, and in particular, differing views on US involvement in other countries. The students left with a new outlook on the challenges of de-nuclearization and the difficulties of diplomacy and collaborative decision making. To see more of their outcomes, please visit the blogs for the Seoul Meetings and the Beijing Meetings. The program also featured two keynote speakers during the culminating simulation weekend, an opportunity for the high school students to hear from and interact with practitioners and experts in the field. This year’s speakers were Ambassador Bonnie Jenkins and Professor Anthony Arend. Amb. Jenkins is a Visiting Fellow at Brookings Institution and the former Special Envoy and Coordinator for Threat Reduction Programs in the Bureau of International Security and Nonproliferation at U.S. Department of State under President Obama. Professor Arend is Professor of Government and Foreign Service at Georgetown University, as well as Senior Associate Dean for Graduate and Faculty Affairs in the Walsh School of Foreign Service. Ambassador Jenkins detailed the provisions and history of the Nuclear Nonproliferation Treaty, the Joint Comprehensive Plan of Action in Iran, the history of North Korea – U.S. relations, and the 2018 Nuclear Posture Review, leaving ample time for personal remarks on the successes and failures of each. Throughout the discussion, she made it clear that “denuclearization is probably not going to happen in one year” because of ongoing developments in countries that are not part of the Nonproliferation Treaty, the amount of current nuclear weapons that exist (14,900, 7,000 of which belong to Russia and 6,800 of which to the US), the politics of the Trump administration that have exacerbated rifts between the US and North Korea, and the election of John Bolton to the position of National Security Advisor to the United States. Overall “it’s going to be a phased effort” to denuclearize and “we have all of you guys here to deal with it,” Jenkins addressed the crowd. Her presentation was thorough and informative, leaving students with a surplus of information to use in the committee meetings to come. Professor of Government and Foreign Service at Georgetown University Anthony Clark Arend delivered an animated and exciting Keynote Address entitled “The World is on Fire”. He asked them to consider the statement, “The future is ours to change but still sometimes it seems it is easier to change the past.” Though changing the future is a daunting task, he told the students that there are four ways to do it: 1) The United States must lead. 2) It must lead multilaterally. 3) It must lead by promoting human dignity. 4) “The fourth point is YOU!” he told the audience.